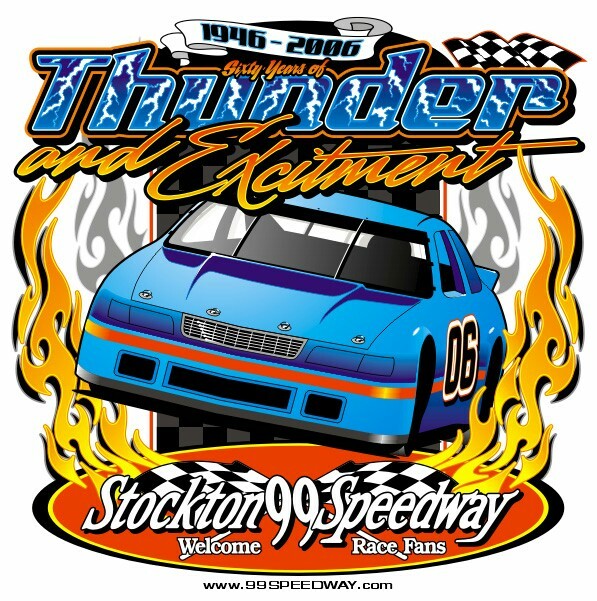 Stockton’s 99 Speedway closed the books on the first half of its 2006 racing schedule with a NASCAR Dodge Weekly Racing Series program, presented by Havoline/C.L. Bryant, that had the crowd on the edge of their seats throughout the entire night. Manteca’s #61, Guy Guibor qualified fourth for the Havoline Western Late Model 50-lap feature, but the invert draw of four, which put him on the pole of the 14-car field, seemed to be just the break he needed to score his first career win. The race took on the frantic feel of dash right from the drop of the opening green flag as Guibor, Pete Hernandez of Sacramento, defending champion Pete Anderson Jr. of Stockton and fast qualifier #21, Dave Byrd of Pacific Grove immediately locked up in a four car battle royal. Guibor steadfastly remained at the front of the pack as the four drivers swapped paint, rubbed tires and maneuvered high and low looking for the slightest advantage to gain position. The epic fight was reduced to three cars on lap 22 when Anderson made a daring attempt to get around both Byrd and Hernandez in one swoop coming out of turn four and spun. Anderson was able to quickly recover and rejoin the race at mid pack without bringing out a caution, but his chances for victory were gone. Ironically, the race took a decisive turn during its only yellow caution period, which occurred after lap 41, after Wilton’s #92, Jason Fenlser got into the outside wall in turn two. As the pack reformed to restart the race, Guibor headed for the pits to change a right front tire that was going flat after running over some debris from Fensler’s mishap. Hernandez, #20, a NASCAR diversity driver with Bill McAnally Racing, took full advantage of Guibor’s misfortune. He chose the outside position for the restart and was able to make it stick after going door-to-door with Byrd for three laps. Byrd still wasn’t done as he latched on to the bumper of Hernandez and tried every trick in his vast arsenal to get around him, but Hernandez was able to hang on despite the intense pressure to notch his first career win at the 99 Speedway. "It feels good to come back like this after what happened last week. I can’t thank my crew enough for putting the car back together," said an elated Hernandez, who was running among the leaders last Saturday when a fluid leak ended his race prematurely. "I feel for Guibor because he had a fast car, but you take what you can get and tonight it was my turn." "It was a blast out there. I feel like somehow I should have made something happen though, but I just couldn’t quite do it," said Byrd. "He (Hernandez) raced more than fair so I hated to rough him up. If I win I want to feel good about it." As expected, the mood was much more somber in the Guibor team stall. "I feel like somebody beat me up right now. There is nothing you can do about it though except shake if off and come back next time," said the dejected Guibor. Mark Holeman, the sensational 20-year old rookie out of Los Altos finished third in the Western Late Model feature, Ron Strmiska Jr. of Stockton came in fourth and Anderson fought his way back to salvage fifth. Jay Linstroth, (left), of Citrus Heights took the lead in the 50-lap Grand American Modified (GAM) main on a lap five restart following a big four car pile up in turn three that brought out the only yellow caution of the event. He and Ripon’s Mike Regelman checked out on the rest of the field from that point on to wage their own personal two-car battle. In the previous GAM feature held two weeks ago Regelman slammed the door on Linstroth to earn his first career win. This Saturday Linstroth gladly returned the favor as he skillfully fended off the hard charging Regelman through the second half of race to capture his second win of the year and pad his season points lead. "He gave me a good challenge and bumped me a few times, but I knew if I could stay smooth I had enough to hold him (Regelman) off," said Linstroth. "I’ve been racing here for five years and I have had some bad luck. I am out to win this final championship." Hometown driver #75, Chad "the Iceman" Holman was virtually untouchable in his impressive wire-to-wire victory in the 50-lap American Limited Stock Car (ALSC) feature, which was completed on a warm track just before nightfall. While Holman made like the "energizer bunny" and just kept going and going, mechanical failures befell most of the other top competitors during the race including fast qualifier Donny Darter of Stockton, Joe Allen of Stockton and Escalon’s Darrell Hughes, who entered the night second in the points to Holman. "I was a little skeptical of my chances at the start because my car usually is loose in the day and runs better at night," said Holman. "It was a good race, but man, I am tired." Lodi’s Jeff Ahl #31 followed Holman to the ALSC checkered flag, Stockton’s #85, Pete Anderson Sr. finished the race in third, defending division champion #15, Charlie Clawson of Modesto took fourth and Matt Erickson of Ceres rounded out the top five. Starting from outside of the front row of the 16-car field, #37, Frankie Marks of Orangevale grabbed the early lead in the 30-lap Legends feature over pole sitter Randy Fellman of Sacramento. For the remainder of the race, Marks held the top spot and appeared to be on his way to a relatively easy victory until a yellow caution flag popped out on lap 27. Fred Clements of Stockton rode his bumper throughout the final laps looking for any opening to steal the lead, but Marks was able to survive the three lap shoot out to earn the win. Kelly Martin of Modesto finished third to complete the podium. The 99 Speedway will be dark next weekend and return to action on Saturday July 1 with a huge NASCAR Dodge Weekly Racing Series program that includes the return of the Havoline Western Late Models for round #6 of the HOTWOOD 1000 Series by JM Environmental, the American Limited Stocks and the Legends in a program presented by Havoline/C.L. Bryant. In addition, the popular West Car Series will race in a 100-lap feature and last, but not least, fans will be treated to a spectacular fireworks show in celebration of the 4th of July holiday.